When 43 extraordinary babies are born on the same day in 1989 to random, unconnected mothers around the world who were not pregnant at the beginning of the day, billionaire Sir Reginald Harvgreeves (Colm Feore) adopts seven of them. He creates The Umbrella Academy, a large home/school where he raises them, in order to prepare them to save the world. The children, wearing masks, become famous for fighting crime in the city where they live. Sir Reginald calls them by numbers, but they're eventually also given names. Only one of them appears to have no powers at all — Number Seven, a.k.a. Vanya (Ellen Page), who becomes proficient at playing the violin, and goes on to write an autobiography giving details about the way she and her siblings were raised. Another one, Number Six, a.k.a. Ben, died in childhood. When the remaining six learn of their father's sudden death, they return home, where they uncover shocking family secrets and learn of an impending apocalypse that they can only ward off if they all band together. 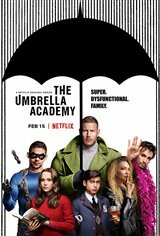 The Umbrella Academy is based on Gerard Way's Eisner-winning comic book series.